to take in setting up adapted intervention programs. establishing partnerships between the actors in the two systems. (Kitwood, 1997; Brittain, Corner, Robinson, & Bond, 2010). with considerable power in our societies (Starr, 1982). tities are increasing in societies tending toward individuation. standing of the linkage process between care systems. capable of being recognized and acting in its own name. that can be threatening to the actor’s identity. 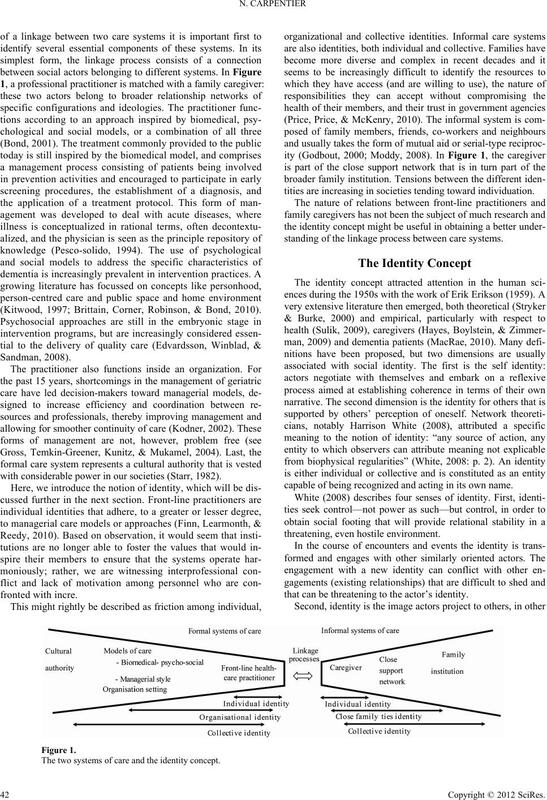 The two systems of care and the identity concept. 2 Copyright © 2012 SciRes. about themselves or their identity (Giddens, 1991). ties involved in the provision of care. sions over the course of a trajectory. care trajectory, including four residential centres. tasks in response to manifestations of dementia. the communication of opinions and propagation of attitudes. could have facilitated or impeded linkages between the systems. significantly modify the trajectory’s course. for one day (No. 9). eleven of whom were from outside the family. marily centred on family responsibility. Transformation of social suppor t and use of services during the 7-year trajectory. 4 Copyright © 2012 SciRes. Caregiver’s social representations at three moments during the care trajectory (partial list of concepts). and they worked together to find a residence for the mother. went to live in a residence chos en by the caregiver . taken to get the mother an appointment at the cognition clinic. sources and proposed a follow-up appointment in six months. which makes it even harder”. 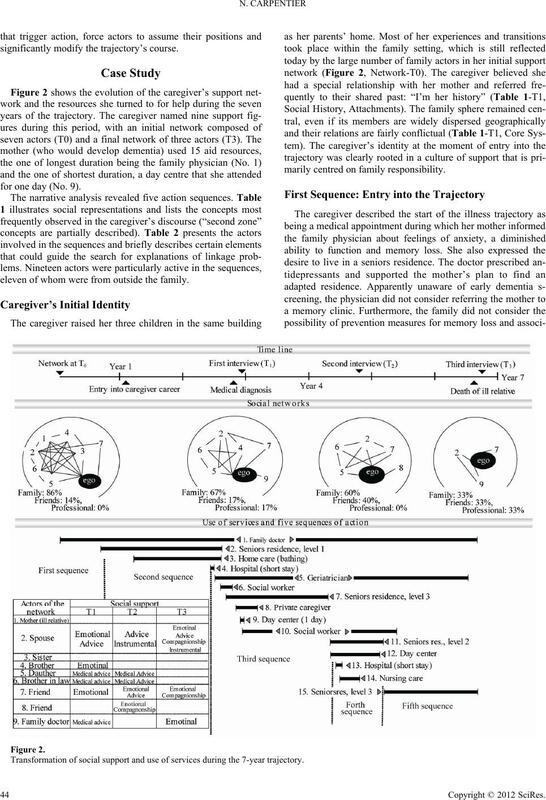 viewed as supportive by the caregiver (Figure 2: T1-T3). social worker helped the caregiver with the transfer. The 19 social actors involved in the five action sequences. 6 Copyright © 2012 SciRes. polite, to be honest. She’s not getting respect there”. concerns (Tab le 1-T2: Other Family Problems). four elements to explain the linkage problems. that is perpetually imbalanced, irregular and unpredictable. only viable exchange in day-to-day life or in a crisis period. a more active and sensitive role in the caring process. reliance on resources outside the family, at least until recently. realized their “negligence” in failing to take preventive action. also in terms of their relative’s dignity. sion of their ill relative illness and to life’s ups and downs. essential to making appropriate decisions. awareness of the importance of human relations in chronic care. nology of a phenomenon and its causal processes (Abell, 2009). 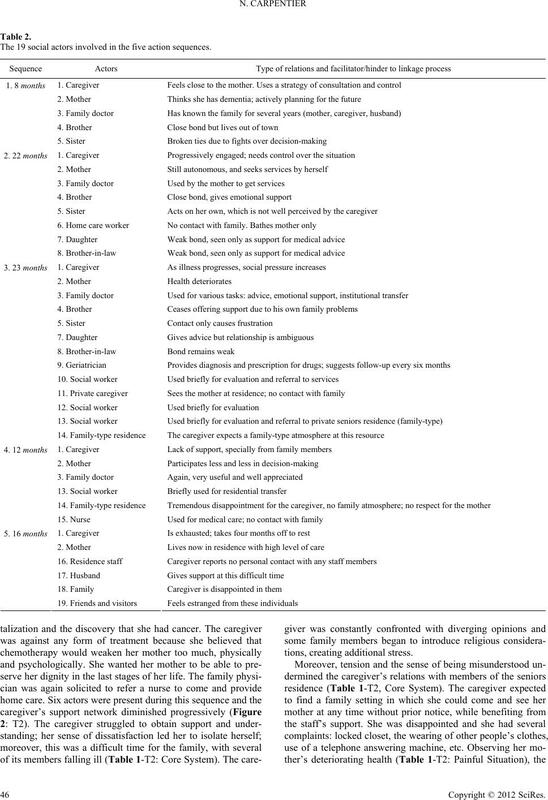 terms of the obstacles to receiving care (Carpnetier et al., 2008). tical value without taking this dimension into account. explanation. 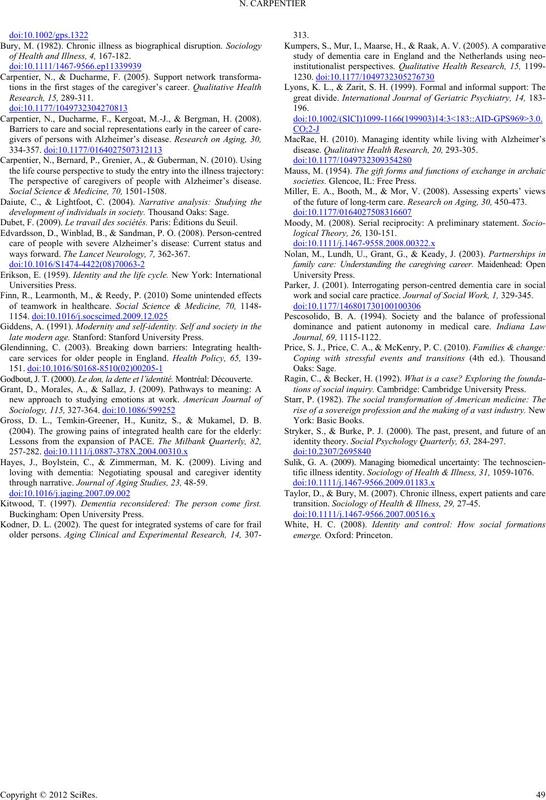 Sociologi cal Meth ods Research, 38, 38-70.
within dementia care triads. Dementia, 4, 185-205. 2009. URL (last checked 2 December 2009). book of dementia care (pp. 44- 61). Bu ckingham : Open University Press. 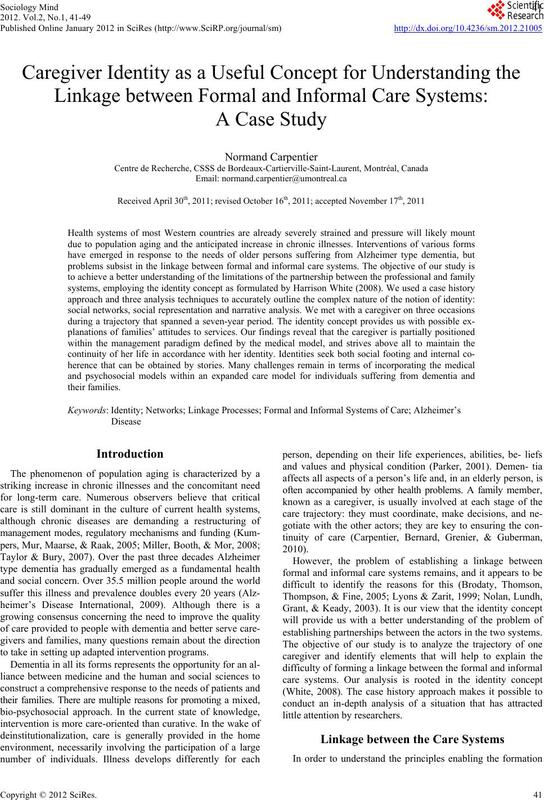 dementia in changing social, physical and technological environments. 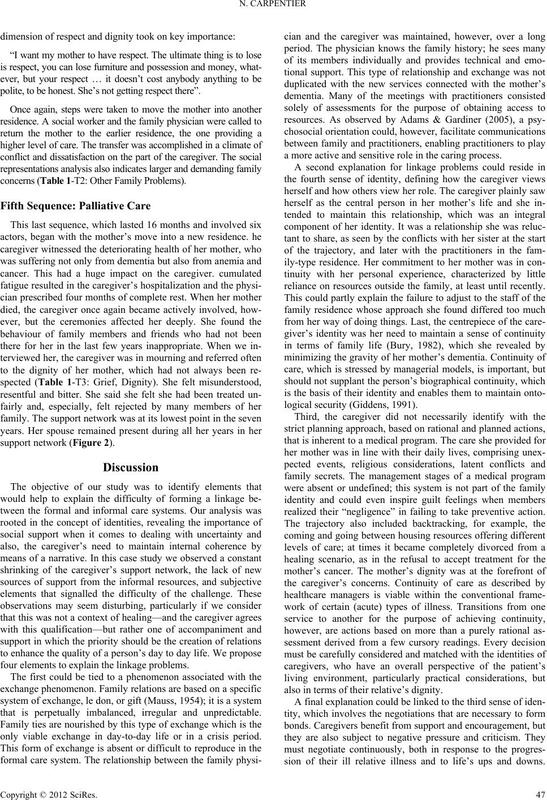 Sociology of Health & Illness, 3 2, 272-287.
caregivers of people with dementia and memory loss don’t use ser v ic es . International Journ a l o f G er i a t r i c Psychiatry, 20, 537-546. 8 Copyright © 2012 SciRes. of Health and Illness, 4, 167-182. Carpentier, N., Ducharme, F., Kergoat, M.-J., & Bergman, H. (2008). 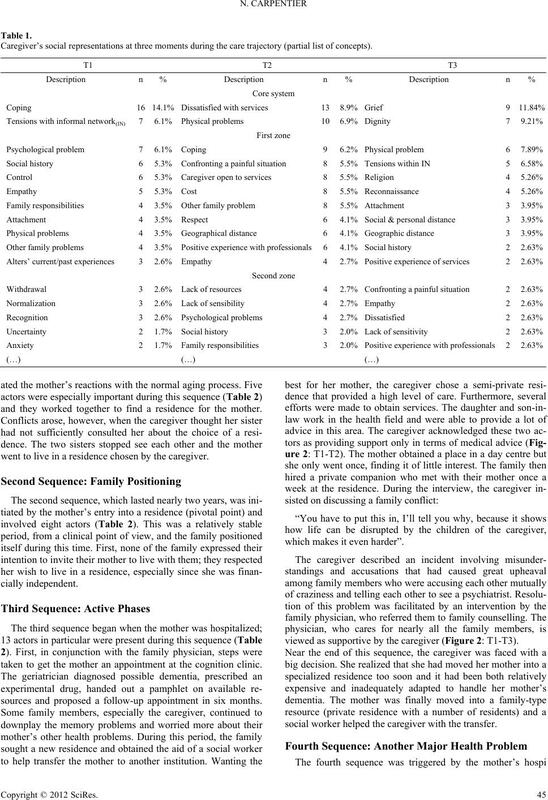 The perspective of caregivers of people with Alzheimer’s disease. Social Science & Medicine, 70, 1501-1508.
development of individuals in society. Thous an d O ak s: Sa ge . Dubet, F. (2009). Le trav ail des sociétés. Paris: Éditions du Seuil. ways forward. The Lancet Neurology, 7, 362-367. Godbout, J. T. (2000). Le don, la dette et l’identité. Montréal: Découverte. Gross, D. L., Temkin-Greener, H., Kunitz, S., & Mukamel, D. B.
through narrative. Journal of Aging Studies, 23, 48-59. Kitwood, T. (1997). Dementia reconsidered: The person come first. disease. Qualitative Health Research, 20, 293-305.
societies. Glencoe, IL: Free Press. of the future of long-term care. 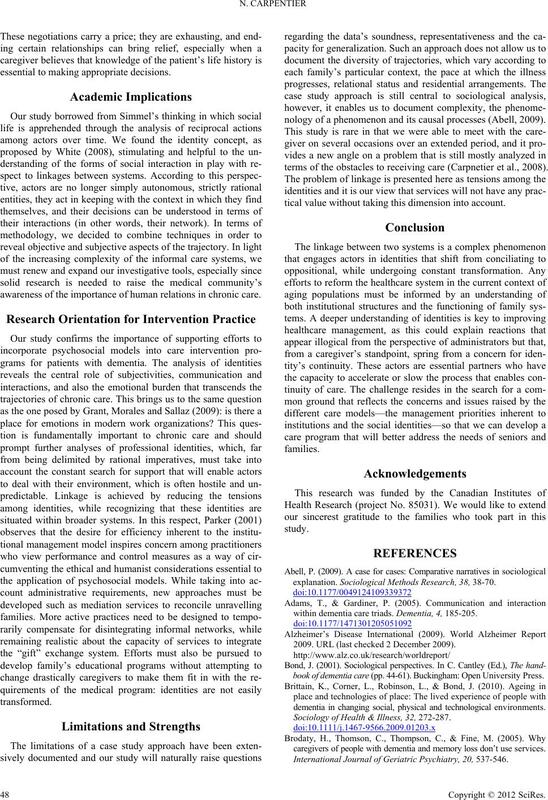 Research on Aging, 30, 450-473.
work and social care practice. Journal of Social Work, 1, 329-345.
tions of social inquiry. Cambridge: Cambridge University Press. identity theory. 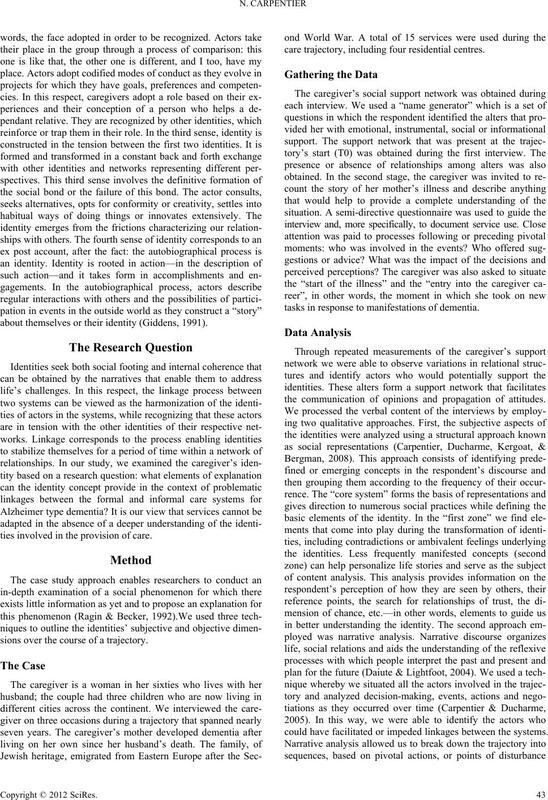 Social Psychology Quarterly, 63 , 284-297.
tific illness identity. Sociology of Health & Illness, 31, 1059-1076.
transition. Sociology of Health & Illness, 29, 27-45.